One of the greatest mathematicians of the nineteenth century, Carl Gustav Jacob Jacobi (1804-51) burst into the limelight with his redevelopment, together with Niels Henrik Abel (1802-29), of the theory of elliptic functions. His pioneering work was characterised by the variety of problems tackled and the power of the tools used to tackle them. His lasting influence on rational mechanics, number theory, partial differential equations, complex variable theory and computation is marked by the number of fundamental concepts that bear his name (the Jacobian, the Jacobi sum and the Jacobi symbol, among others). His collected works, comprising treatises, letters and papers written in German, Latin and French, were published in eight volumes between 1881 and 1891, edited chiefly by Karl Weierstrass (1815-97). 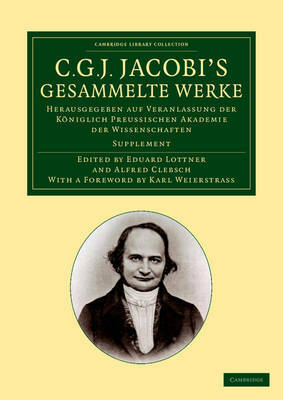 Published in 1884, this supplementary volume contains Jacobi's 1842-3 lectures on dynamics as compiled by Alfred Clebsch (1833-72) in the revised second edition by Eduard Lottner (1826-87).